Many people don't know this, but horses aren't "stuck with the feet they have". Over time, their feet can be restored and can reach a state where continual development is possible. Don't say "That's just what they have." Hoof development is not necessarily limited by age, conformation, or even tissue damage. I believe it's mostly limited by knowledge and perception. For instance, someone can have a lot of success keeping horses sound with their trimming and booting protocol, but when they teach someone else that student has their own experience and interprets it a little differently than the teacher. When that student teaches someone else, the same thing happens and this goes on and on until the details of the original protocol get lost in translation. It becomes very unreliable, like the telephone game. If the founder of the original method is unfortunate enough to have their name attached to it, they will most certainly get as much blame as praise. The success rate may become uncontrollable and a new method will eventually arise. There have been plenty of good trimming methods developed by good practitioners, and the best ones are constantly evolving (methods and practitioners). What you don't hear so much about is hoof development. I believe this is because everyone is too busy arguing about trimming methods to realize the incredible regenerative qualities of the horse's hoof. Almost any hoof, whether the horse is young, old, or debilitated. The challenge is methodology. There is a certain relationship that the hoof structures have to be in for the hoof to reach growth equilibrium and for the structures to reach a state of continual development: a relationship that must be maintained constantly. This is one of the lessons of the Mustang Model. It's nothing new. Horses have been doing it for themselves for eons. 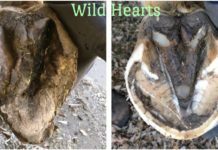 Many hoof care practitioners realize the advantage of self wear for establishing individual physiologically correct hoof conformation. For some, including myself, it is a source of great frustration. I'll admit that when I first heard claims of achieving barefoot soundness from acres and acres with 24/7 movement on varied terrain my reaction was "What about the rest of us who only have small acreage or just a rented stall?" After I brooded on this for a while, the thought crossed my mind, "Why not simulate the wear?" The only thing I had to change was the frequency of my trim. I had noticed on my own seven horses that within one week of beveling the wall in order to load the peripheral border of the sole, they had already grown enough wall to transfer the weight from the peripheral border of the sole back to the wall. All the photos of wild hooves and the self trimming domestic hooves that I had seen looked more like my horses directly after a trim, so I decided to increase the trim frequency to once a week. This isn't an original idea. 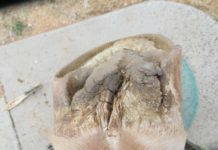 There are plenty of horse owners that ride regularly, do their own trimming, and dress their horses feet up a little just before or after a ride to keep the chipping and cracking down or to keep their boots fitting optimally. I just decided to do it on seven of my own horses for as long as I saw favorable results. That turned out to be about seven years. 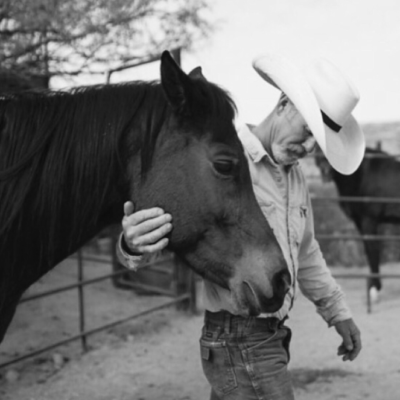 Most of my horses were rescues with hoof/body issues and less than favorable conformation. I found that when I kept their feet perfectly balanced, the structures began to develop and take on a shape of their own. 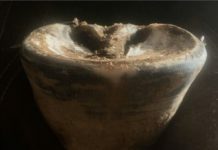 This contributed to the overall unique shape of each foot and transferred into the improvement of the horse's conformation. They were all standing more square and this, in turn, transferred into their hooves, maintaining their balance. The longer I kept at it, the less I had to do at each trim interval and the better their feet and bodies looked. And the better they were moving. They all fit nicely into Easyboot Gloves, and though they could be ridden bare foot, they went even better when booted. It's been about ten years since I started my simulated self wear experiment. A few years ago, I completed my track system and imported tons of sand. The extra movement and forgiving footing has allowed me to reduce the trim frequency to 2-3 week intervals with out compromising hoof development. 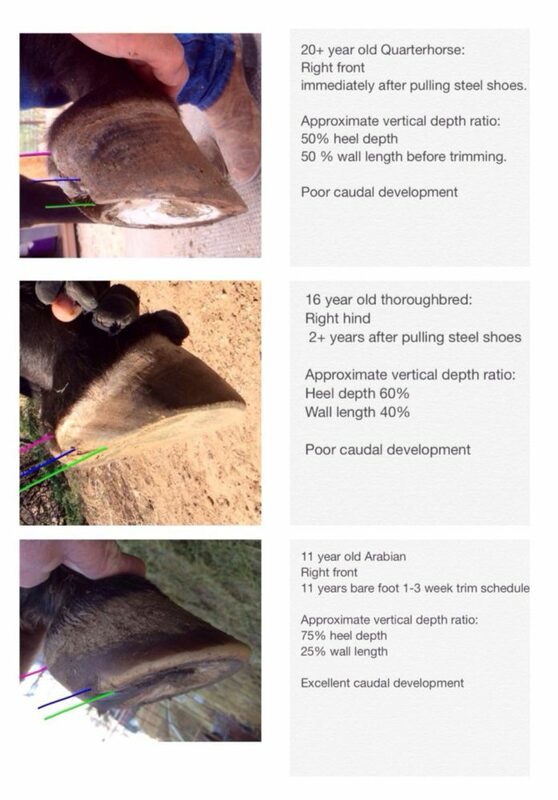 Caudal hoof development can be measured by assessing the ratio of vertical heel depth compared to vertical heel wall length. A well developed heel has more heel depth than heel wall length. Here are three examples of of heel development. I've measured the vertical heel depth from the pink line at the hairline to the blue line at the termination of the collateral grooves and the heel wall length from the blue line to the green line at the ground bearing surface of the heel wall.